'13 age-out corps members, these tickets are for you! 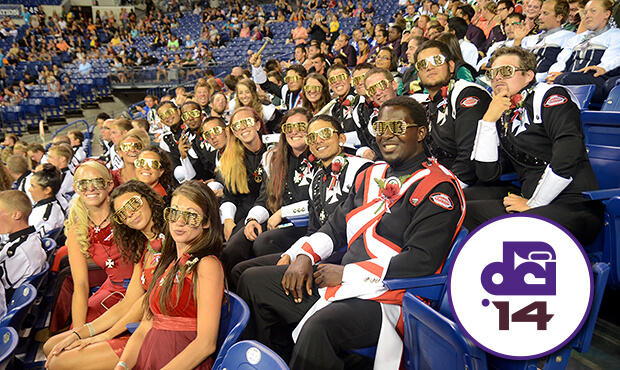 Age-out corps members enjoy the ceremonies following the 2013 DCI World Championship Semifinals in Indianapolis. Drum Corps International once again invites last summer's age-out corps members to become lifelong members of the ever-growing community of drum corps fans. If you completed your last eligible performance season with a Drum Corps International unit during the summer of 2013, you are eligible to receive two free tickets to your choice of select events on the 2014 DCI Tour. "This age-out ticket program is a token of appreciation from Drum Corps International for all the hard work and dedication these young musicians put in during their careers as members of DCI corps," DCI Ticketing Manager Brian Keller said. "It's our way of thanking them for embodying what the spirit of drum corps is all about, and for enriching the activity for years to come." Related content: Congrats to the age-out class of 2013 Age-out corps members in good standing with their respective organizations after completing the 2013 summer season can receive two tickets to their choice of one of the following 2014 DCI Tour events: DCI Southwestern Championship Saturday, July 19 - San Antonio, TX DCI Southeastern Championship Sunday, July 26 - Atlanta, GA DCI Eastern Classic Friday, Aug. 1 - Allentown, PA DCI Eastern Classic Saturday, Aug. 2 - Allentown, PA DCI World Class Championship Finals Saturday, Aug. 9 - Indianapolis, IN.